Chamber of Commerce Rebrand puts Bridport Business in the Spotlight. Bridport’s Chamber of Trade and Commerce is being rebranded as Bridport Business to highlight its role in supporting local business. The launch is being supported with a new website, which will also serve as a directory for local businesses, as well as a fresh new logo. 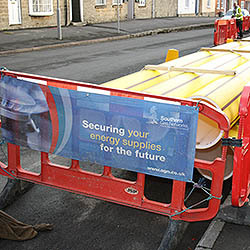 Following confusion regarding the scheduling of the South Street Gas Works a Bridport Business committee member kindly offered to contact Scotia Gas Networks to confirm the situation. Read the President's comments regarding the loss of two more Bridport shops here. Read the President's comments regarding the closure of the Southgate car dealership here.